Wow! What can we say about this gorgeous female? 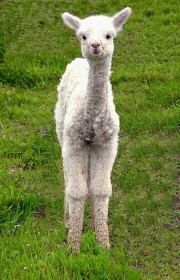 Princess is the product of 6Peruvian Jude and Snowmass Incaacooyo Star, a full Accoyo who leaves his mark on all of his offspring (see Starburst). Princess has very dense, crimpy fiber from head to toe and represents what we feel is the “total package”. Her fiber took first at the 2005 NECC with a 19.5 out of 20 score in Handle & Fineness. 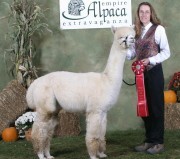 We were so pleased with her second place at the 2005 Empire Extraganza in a large class judged by Dr. Sumar, placing behind the white color champion and described as two very similar animals. And to top it off, she has the best disposition! 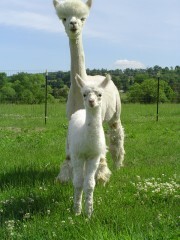 Princess is now a mom, giving birth to Jered, a beautiful Archangel son! She was rebred to Snowmass Snow King, giving us Urien. Her most recent offspring is Derron, out of Golden Sovereign, a Legacy Gold son.